The outdoor summer entertainment kicks off with “Despicable Me 3” at Kensico Dam Plaza in Valhalla, on Friday, July 6. The series will continue at Kensico Dam Plaza with “Paddington 2” scheduled for Friday, Aug. 10. The fun begins at 6:00 pm with food trucks and carnival games from PM Amusements. The movie starts at sundown. Campers welcome (and encouraged!)! Show up in your Camp T-Shirt and the Camp with the most representation wins free Ice Cream from Longford's Ice Cream Truck on site that night! Plus Westchester Talk Radio will schedule a winning visit with special prizes for the campers! Moviegoers should bring blankets, folding chairs and a picnic. Refreshments will also be available for sale. In the event of rain, the movie will be canceled. Entergy Screenings Under the Stars is presented by Westchester County Parks and Sharc Creative. Questions? 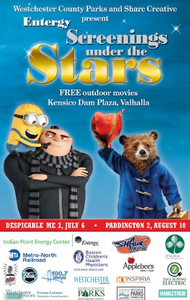 Visit Entergy Screenings Under the Stars online here. Learn more about Entergy Screening Under the Stars on YouTube here.